For the only time within the NASCAR Sprint Cup season, the points standings will be left unaffected by the results of this race. 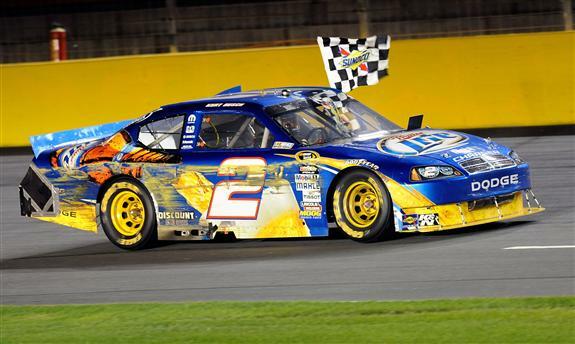 The 2010 Sprint All-Star race enjoyed its 26th running on the 1.5 mile Charlotte Motor Speedway. Starting off the evening, the Sprint Showdown placed a field of non-qualified drivers for the main event. Martin Truex Jr in the #56 NAPA Toyota win the Sprint Showdown passing Greg Biffle's #16 Ford through the latter laps of the 50-lap competition. While both 1st and 2nd place cars received transfers spots into the All-Star race, Truex Jr obviously wanted at least one win for the night. At approximately 8:30 p.m., NASCAR Sprint Cup driver introductions saw 21 drivers taking the stage (18 qualified All-Star drivers, 2 Showdown transfer drivers and one fan vote driver). Announced using a texting platform, Carl Edwards was declared the the fan choice as him and his #99 Roush-Fenway Racing team took to the stage before the drivers entered their race machines. Through the early race running, Jimmie Johnson and Kyle Busch led the show. Kurt Busch was a fixture at the front early in the 20-lap third segment but suffered up to two brushes with the outside wall leading some to discount the #2 Dodge. However, the #2 Penske Racing pit crew utilized the 10 minute prior to the final 10 lap segment to undo the battle damage relating to mechanical issues. Following the 10-minute layover, teams returned to pit road to take tires (NASCAR came up with a clever idea to forbid tire changes under the break so pit stops will still become a crucial factor to the final laps). Benefiting from the psyched-up #11 FedEx team which had earlier in the week won the Pit Crew Competition, Denny Hamlin emerged the leader for the race restart with Joe Gibbs Racing teammate Kyle Busch starting alongside. 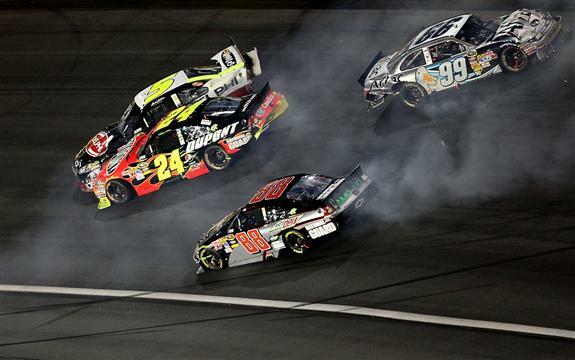 As typical to All-Star events at Charlotte, drivers appeared to address the first three segments conservatively awaiting the final segment. Once the flag dropped for the fourth and final segment, the rather tame field lit up with aggression immediately after the green flag flew. Fifth place car on the restart the #20 Toyota of Joey Logano lept to the inside of Jimmie Johnson's Chevrolet. Johnson's horsepower countered Logano's run causing the #20 to rejoin his place behind the #48 Chevrolet. However, as Logano regained his position, he tapped an already out of shape Mark Martin. Martin #5 Chevrolet was involved with 3 incidents of contact seconds after the restart and lost control down the front stretch rolling into the first corner. 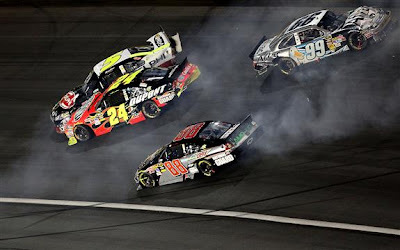 Triggering a multi-car accident involving Jeff Gordon, David Reutimann, Jamie McMurray and Carl Edwards ending the hopes of their Sprint All-Star win. Dale Earnhardt Jr #88 Chevrolet and Tony Stewart #14 Burger King Chevrolet were also part of the wreck but continued with only minor damage. With laps not counting, the field essentially reset the 10-lap shoot-out with #11 of Hamlin leading the #18 of Busch. As the race ensues, Kyle Busch sought an opening on a wide FedEx race machine making itself wide to head off any charge. Through turn 1 with 7 laps to go, Kyle Busch saw an opening which he could place the #18 Toyota outside of his teammate not knowing that the teammate relationship was not the priority of Denny Hamlin. Moving up the track running out of the turn 2 section, Busch remained eying the shrinking hole only to impact the wall. While no contact was made between the Toyota Camrys, the incident would garner some bad feelings from Kyle Busch which would become evident by the end of the night. In the meantime, Kurt Busch's #2 Dodge was making a spirited march from 5th on the segment start to breathe heavily on the necks of the two Toyotas. Easily passing his younger brother's wounded car, Kurt Busch roared for Denny Hamlin. Perhaps partly enraged for the blocking move the #11 pulled on his brother Kyle, the Miller Dodge of Kurt Busch moved like lightning by Denny Hamlin to take the lead with 6 laps left. With 2 laps remaining in the segment, Kyle Busch's anger toward Denny Hamlin would reach critical mass when the #18 shot into the outside wall on the front stretch. Clipping the Budweiser #9 Ford of Kasey Kahne also in the incident, the #18 M&M Pretzels Toyota was angily driven to pit road. Blaming the earlier incident with Hamlin, Busch waited inside the #11 hauler. After the race the two competitors finally met with team owner Joe Gibbs refereeing his two drivers to a peaceful resolution. However, Hamlin appeared less than apologetic following the race incident through a Twitter response. "And if roles were reversed kyle would check up and pull down?? Lol.. Ok back to reality." Both intense drivers on the track, Denny Hamlin was also not surprised by Busch's reaction saying in another Twitter message "He's a guy that wants to win just as bad if not more than me." In the end, Kurt Busch stormed to victory for his first Sprint All-Star victory holding off Showdown winner Martin Truex Jr in the final lap. Rounding out the top-5 after the final segment was Joey Logano, Denny Hamlin and Tony Stewart. Making an entire 1.5 miles celebration lap in reverse, Kurt Busch would go on to claim over a million dollars along with the trophy for the #2 Miller Lite Dodge. Driving for Roger Penske, this concluded a perfect day after the Penske Racing IndyCar program took pole as well as three of the top four positions for next week's Indy 500.